This is a two-component water-based injection Caulking material developed specially by our company. Apart from caulking of cracks in standard RC structures, it also provides hardening water-stopping to below-grade mortar cleavages. 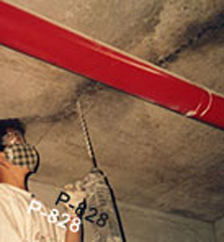 The cost of the caulking agent is also far lower than most water-reactive foaming materials or epoxy reinforcements. Expands only slightly so it does not deform aluminum door and window frames. Formed colloid does not shrink easily unlike water-reactive foam materials that dry and shrink after a period of time. Water-based, non-toxic and without the stinging smell of solvents. Low viscosity, good flow properties so it penetrates cracks well By adjusting the amount of accelerator controls the formation of the colloid as required. Injected caulk for aluminum windows and doors.